Evolution of the ETF market, impact of the regulations, ongoing development at BNP Paribas Asset Management...Isabelle Bourcier, Head of quantitative and index management at BNP Paribas Asset Management shares its view with Next-Finance. Next-Finance : What was the overall trends for the ETF market in 2017 ? Overall the ETF market growth remains strong globally. For Europe, this year, the market was more dynamic than in the US, with an increase of Assets Under Management of more than 34 % according to ETFGI. 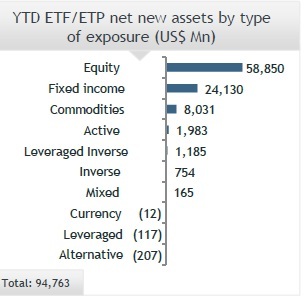 In Europe, net new assets are also strong year to date, with $ 58,8 billion collected at the end of October for Equity ETFs and $ 24,4 billion for Fixed Income ETFs. Isabelle Bourcier : Do you see an increase in the use of ETFs among asset managers? Institutional investors ? And distributors ? Asset managers remain large users of ETFs, especially those specialized in mixed asset allocations as these products enable them to build diversified portfolios on whatever asset classes. On the institutional side, there is also a strong demand, investors often use passive index funds in their asset allocation, adding ESG and/or decarbonization filters. Finally, for private banks and IFAs, it is clear that the implementation of MIFID II in 2018 will attract more and more interest from them. For private banks and IFAs, it is clear that the implementation of MIFID II in 2018 will attract more and more interest from them. What is / will be the impact of the regulation (MIFID II in particular) on the ETF market? Will the regulation boost the Robo Advisors Platforms? Is this a source of growth for ETFs? As observed in the Netherlands and in the United Kingdom, when the retail distribution review (RDR) entered into force, MIFID II should gradually push distributors to use more and more ETFs in their asset allocations. To achieve this, Robo Advisors’ platforms already rely on ETFs to more efficiently allocate to and across different asset classes. What assessment for BNPP AM in 2017 and your projects in passive management after your reorganization? How do you position yourself against the competition, especially in France and Europe? Our ETF & Index activity is now integrated into a division including all quantitative and index fund management at BNPP AM and accounts for more than € 17,5 billion of assets under management at the end of October 2017. For ETFs, our assets stand at € 7,7 € billion at the same date, compared with € 4,5bn in September 2017. At the same time, we have gained some market shares, we are now ranked number 10th in Europe (vs number 14th a year ago). We also intend to develop our product range with the launch of SRI and bond ETF in the coming months. What are your growth segments in terms of products? Smart Beta ETFs and SRI ETFs? Do you intend to continue to expand your range on these two segments? Our ambitions is to grow in Smart Beta and SRI ETFs, segments on which we have recently expanded our product range to better meet investor demand. We also intend to develop our product range with the launch of SRI and bond ETF in the coming months.